During one of the Chinese New Year, we were making my favorite pineapple tarts when the oven decided to retire. Since then, we stopped baking. Lately, my friends around me are making lovely cakes every week and I am really tempted to bake. I was recuperating from my sprained ankle for the whole of last week and I dropped by a bookstore to buy some magazines to kill my boredom. Then, I saw a cook book on steamed cake, I thought, I can steam cakes! 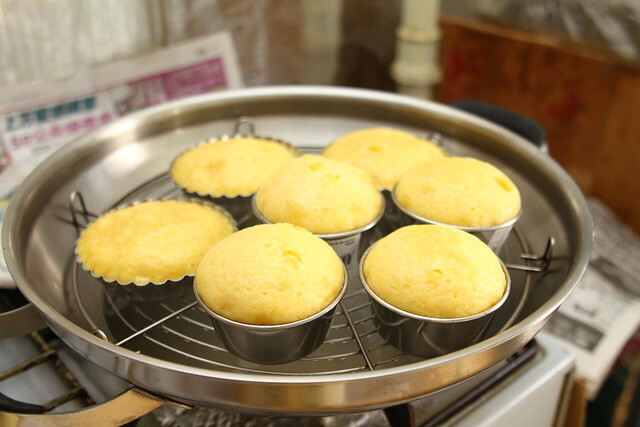 Compared to the familiar baked cake, the popularity and exposure of steamed cake is far lower than the former. 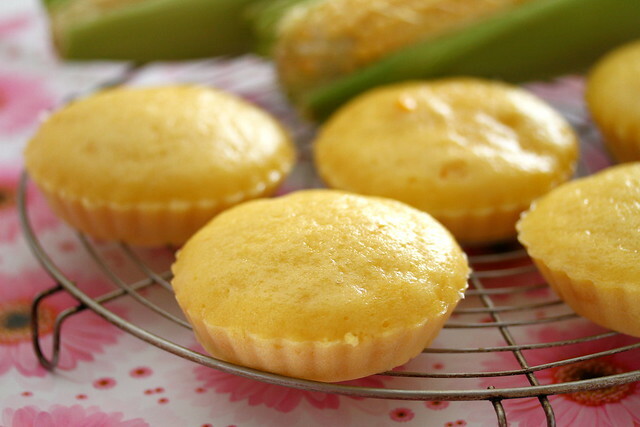 Steamed cakes uses only eggs, sugar, flour and a small amount of oil. The end product is closer to the colour of its real ingredients and the making process is much simpler. It is definitely low in calories and hence beneficial to health. 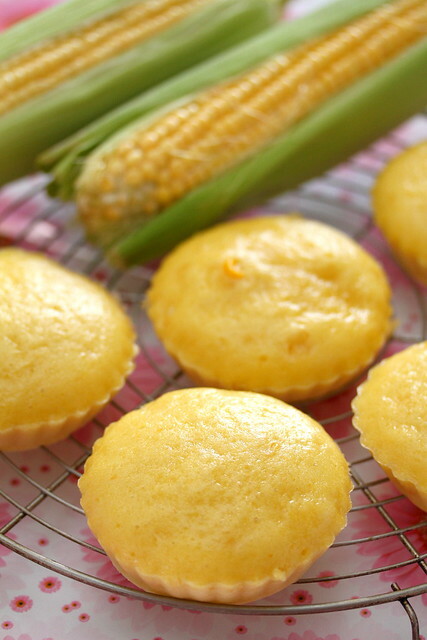 Here, I present to you the recipe of Sweet Corn Cake (adapted from Magic Steamed Cake by Alex Goh). My family loves it very much and I hope you love it too! 1. Whip A until light and fluffy. Add in B, mix until well-blended. 2. Fold in C, mix until well blended. Add in D, mix until well-incorporated. 3. Pour the mixture into greased and floured cupcake mould. Steamed cake needs high heat at the beginning. Set at high heat for 5 minutes, the batter will then be set. Don’t open the lid as it will cause the batter to sag easily. 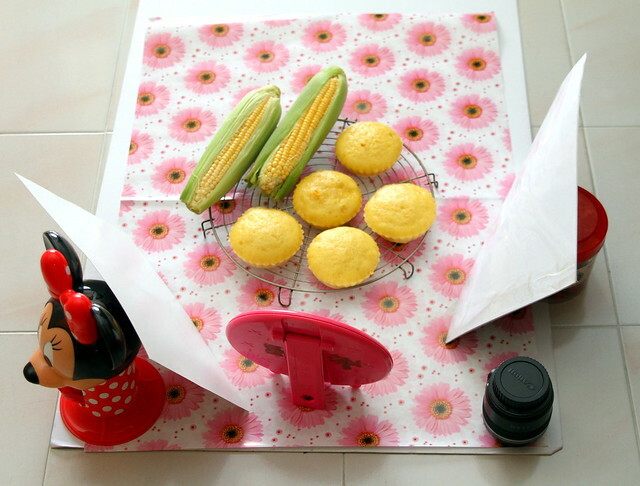 After 5 minutes, switch from high to low heat to prevent the cake from becoming wet. As most families do not have professional steamers, it is likely that the steamed cake may exhibit holes, cracks and coarse surface. Remember to just fill the batter until 60% full, so that the cake will come out nicely in both proportion and size. This is my photography setup at home. Please ignore the Minnie Mouse sweet stand. I love Minnie Mouse but that’s not important!